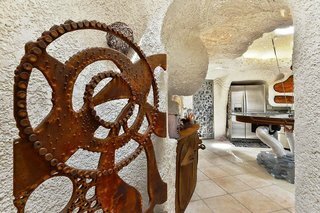 The instantly recognizable "Flintstone House," originally built in 1976 by Bay Area architect William Nicholson, has been a treasured novelty for passersby on Interstate 280 for decades. In recent years, its latest owner Florence Fang has built on its reputation as a modern-day home for that iconic Stone Age family by adding whimsical statues of prehistoric beasts. A strategically placed "Yabba Dabba Doo" sign on the property even evokes Fred Flintstone’s trademark exclamation from the 1960s cartoon. Motorists on the nearby Doran Memorial Bridge can see the home as they cross over San Mateo Creek heading north to San Francisco. However, not everyone is pleased with the additions. A complaint filed by the Town of Hillsborough (where the home is located) in State Superior Court this week cites "life-safety hazards" in the renovations done by Fang, reported The New York Times. The town is seeking to have the dinosaur statues and other landscaping upgrades removed. The improvements were "designed to be very intrusive, resulting in the owner’s ‘vision’ for her property being imposed on many other properties and views, without regard to the desires of other residents," states the complaint. A full view of Fang's additions to the Flintstone House, which includes large, oxidized-steel sculptures of dinosaurs and a giraffe—some over 15 feet high—and a "Yabba Dabba Doo" sign. 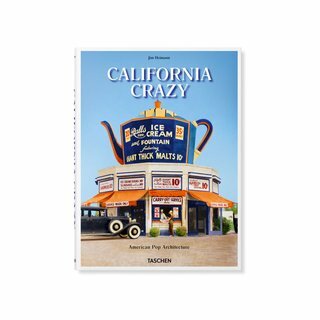 West Coast Wild California's architectural anomalies At the dawn of the automobile age, Americans predilection for wanderlust prompted a new wave of inventive entrepreneurs to cater to this new mode of transportation. 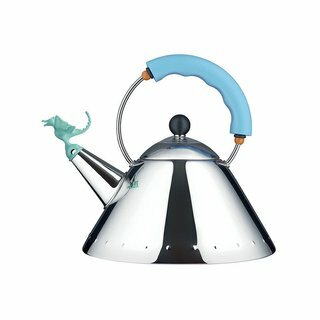 Thirty years after the release of Michael Graves' famous 9093 Kettle, Alessi proudly debuts its fiercer relation, the Alessi Tea Rex Kettle. Instead of a singing bird, this kettle features a dragon whistle, a happy fellow that sings with steam (rather than breathing fire). 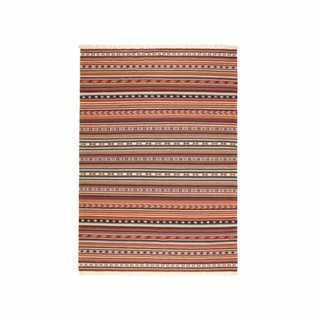 Handwoven by skilled craftspeople, each one is unique. 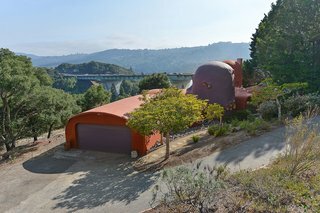 The 2,700-square-foot home situated on a hillside at 45 Berryessa Way is one of monolithic dome construction. According to Atlas Obscura, it was originally constructed out of steel rebar and wire mesh frames, placed over large inflated balloons, and then sprayed with high-velocity concrete known as gunite. After it started to sink and cracks appeared in the walls due to water runoff from the steep hillside, the three-bedroom, two-bath house was rescued by a full renovation undertaken by B.H. Daniller, an Australian architect specializing in waterproof coatings. "Many of the neighbors thought it was an eyesore," Daniller told The Wave Magazine at the time. "I think they were disappointed when I repaired it and it got sold again." Apparently so, as the house inspired the formation of a local architectural review board by residents who were determined not to have anything similar grace the hills of the wealthy San Francisco suburb. The home's interior, pictured prior to its sale to Fang, reflects its curvaceous, concrete exterior. A second remodel by Bay Area architect Eugene Tsui followed in the 2000s, before the home changed hands once again. Fang, whose family published The San Francisco Examiner among other newspapers, snapped up the home for a steal in 2017, reportedly paying $2,800,000, down from an asking price of $4,200,000. 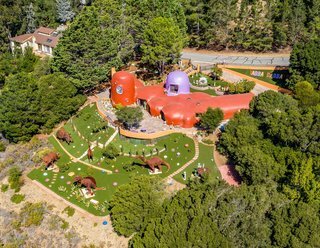 She proceeded to add 15-foot statues of dinosaurs and other prehistoric creatures, plus some oversized mushroom sculptures in a variety of colors to complement the home’s now red and purple domes. 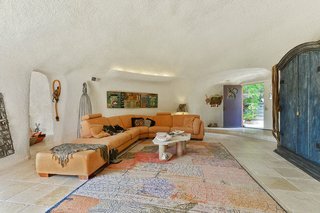 According to pictures from the home prior to the sale, the interior of this unique abode is suitably Wilma and Fred-esque. Every room of the curvaceous, concrete construction is round, even down to the porthole windows, multiple concrete pockets that act as shelving, and an ice cream cone-inspired spiral staircase leading to the third bedroom. One can almost picture Wilma and Betty preparing dinner in here. While a hit with motorists driving past, the home’s popularity with the neighbors has not increased with the new additions. The complaint filed against Fang alleges she has violated local building codes and refused to comply with the town’s orders to remove the features she added. The town has officially declared the house a public nuisance. 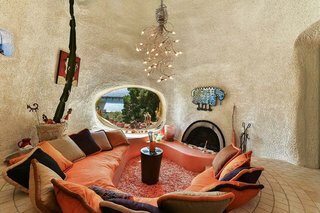 The Flintstone House living room has a cavernous feel. "I think the dinosaurs are beautiful. They make everyone smile and should stay," Sean Fang, Florence’s grandson, said in a statement to the Associated Press. 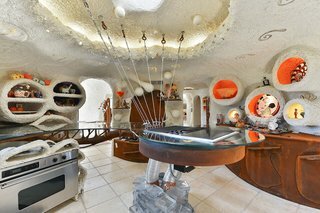 He added his grandmother "will fight to save the Flintstone House." Curvy walls undulate throughout the home, making a rectangular refrigerator look quite out of place.